The Case of the Missing Laptop - CHARTER SCHOOL WATCHDOG http://www.charterschoolwatchdog. The boys are all frazzled because they are apparently stealing from each other now and cannot keep track of where the "school's stuff" is going as they transfer each other, and the "stuff" around. But as you will see, they all agree that it is okay to take the "stuff" as needed (despite the fact that the '"stuff" has been paid with school funding). And, by the way , we thought that these schools were supposed to be separate entities, so how is it they can agree to take the school's property at will and simply transfer it when they feel like it? 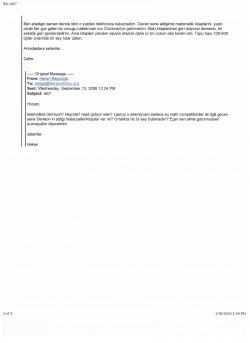 And note once again the reference to "Allah," in the emails that are from Directors of publicly-funded schools. Isn't that a violation of some sort -- you know, like a little thing called the "separation of church and state?" Hey, guys, you might want to read up on that, it's in our United States Constitution. 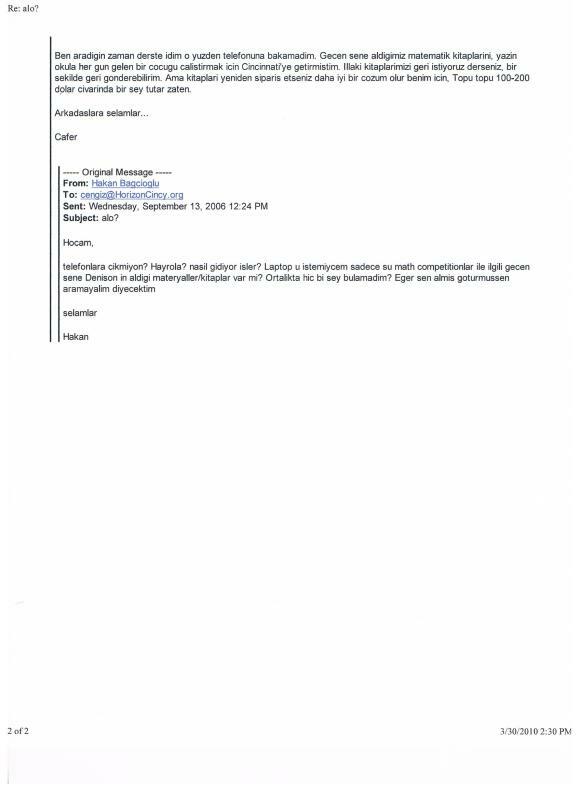 The emails with translations (in red). Murat Hocam, laptop icin bir sey demiyorum ama mazeretim var. Hala Guray Bey'in bilgisayari teslim etmesini bekliyorum. Bu konuda sizin magdur durumda kaldiginizi da kabul ediyorum. Insaallah yakinda cozulecek, Guray Bey'e gore bu hafta sonu. Normalde gecen hafta sonu Columbus'a gittigimde ondan bilgisayari almistim. Bilgisayar bozuktu ve alirken bilgisayarin calismadigini biliyordum. 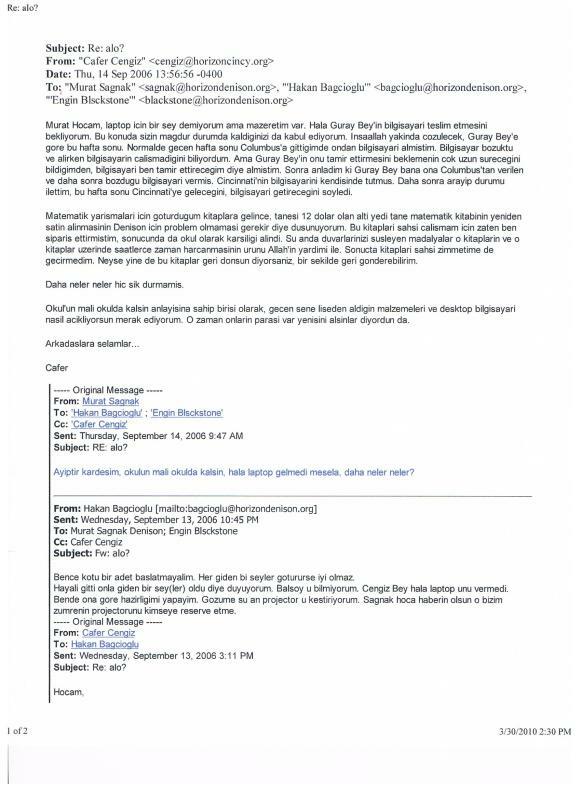 Ama Guray Bey'in onu tamir ettirmesini beklemenin cok uzun surecegini bildigimden, bilgisayari ben tamir ettirecegim diye almistim. Sonra anladim ki Guray Bey bana ona Columbus'tan verilen ve daha sonra bozdugu bilgisayari vermis. Cincinnati'nin bilgisayarini kendisinde tutmus. Daha sonra arayip durumu ilettim, bu hafta sonu Cincinnati'ye gelecegini, bilgisayari getirecegini soyledi. Dear Murat Hodja, I didn’t say anything about the laptop, but I have an excuse. I am still waiting for Mr. Guray to return his laptop. I accept that you are the victim. I hope that it will be solved soon, this weekend according to Mr. Guray. I took the laptop from him when I went to Columbus last week. It was broken and I knew that it was broken when I was taking it. But since I knew that it was going to take very long time for Mr. Guray to fix it, I took it to have it fixed myself. Later, I realized that Mr. Guray gave me the laptop which was given to him from Columbus, and which he himself had broken. He kept Cincinnati’s laptop for himself. I called him later and let him know. He told me that he is coming to Cincinnati this weekend and is bringing the laptop. Matematik yarismalari icin goturdugum kitaplara gelince, tanesi 12 dolar olan alti yedi tane matematik kitabinin yeniden satin alinmasinin Denison icin problem olmamasi gerekir diye dusunuyorum. Bu kitaplari sahsi calismam icin zaten ben siparis ettirmistim, sonucunda da okul olarak karsiligi alindi. Su anda duvarlarinizi susleyen madalyalar o kitaplarin ve o kitaplar uzerinde saatlerce zaman harcanmasinin urunu Allah'in yardimi ile. Sonucta kitaplari sahsi zimmetime de gecirmedim. Neyse yine de bu kitaplar geri donsun diyorsaniz, bir sekilde geri gonderebilirim. As to mathematics books which I took, I don’t think that it is a big problem for Denison to purchase new mathematics books, since each of that is $12. I already ordered those books for my personal purposes. As a result, the school gets the compensation. Now, the medals which are garnishing your walls are the result of those books and hours of work from those books with the help of Allah. As a result, I did not take those books for my personal use. If you still want those books back, in a way, I will send them to you. Daha neler neler hic sik durmamis. More and more, it is not chic. 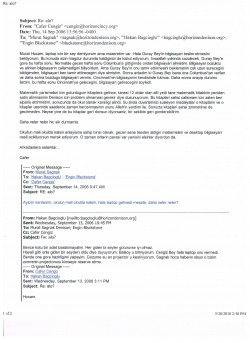 Okul'un mali okulda kalsin anlayisina sahip birisi olarak, gecen sene liseden aldigin malzemeleri ve desktop bilgisayari nasil acikliyorsun merak ediyorum. O zaman onlarin parasi var yenisini alsinlar diyordun da. As a person who believes that school’s stuff is at the school, I wonder how you explain the materials and the desktop computer you took from the high school? You were saying that they have money and that they should buy new ones. Ayiptir kardesim, okulun mali okulda kalsin, hala laptop gelmedi mesela, daha neler neler? It is shame, let the school’s stuff stay at the school. For example, the laptop has gone, and more and more. Bence kotu bir adet baslatmayalim. Her giden bi seyler gotururse iyi olmaz. Hayali gitti onla giden bir sey(ler) oldu diye duyuyorum. Balsoy u bilmiyorum. Cengiz Bey hala laptop unu vermedi. Bende ona gore hazirligimi yapayim. Gozume su an projector u kestiriyorum. Sagnak hoca haberin olsun o bizim zumrenin projectorunu kimseye reserve etme. Let’s not start a bad tradition. It is not good if each leaving person takes something with him. Hayali left and I think he took something. I don’t know about Balsoy. Mr. Cengiz has not returned his laptop. I am prepared for that. I think I will take the projector. Mr. Sagnak, it is our classes projector, don’t reserve it for anybody. Ben aradigin zaman derste idim o yuzden telefonuna bakamadim. Gecen sene aldigimiz matematik kitaplarini, yazin okula her gun gelen bir cocugu calistirmak icin Cincinnati'ye getirmistim. Illaki kitaplarimizi geri istiyoruz derseniz, bir sekilde geri gonderebilirim. Ama kitaplari yeniden siparis etseniz daha iyi bir cozum olur benim icin, Topu topu 100-200 dolar civarinda bir sey tutar zaten. I was in a lesson when you called me, so I could not answer your call. I took the books which we purchased last year to Cincinnati to teach a kid who come to the school every day at summer. If you really want to get the books back, I can find a way to deliver them to you. It would be better solution for me if you order the same boosk again. They are at most 100-200 bucks. You don’t answer the phone? What’s up? How are you doing? I am not going to ask you to give the laptop back. It is related to the math competition. Do you have the books Denison purchased last year? I could not find them. If you took them with you, I don’t need to look for them.